At first glance, the Kenco Pipe Lift’s construction shows what appears to be a simplistic scissor-style friction lift. But as you delve in further, you can see how it has been meticulously designed with extra consideration given to its performance in real world operations. Other inferior pipe tong’s narrow profile require locating the exact center to maintain control of the pipe during the lift. 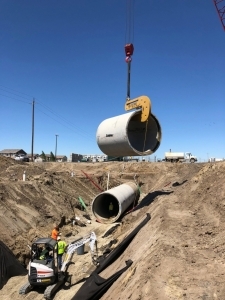 However, the Kenco Pipe Lift is built with an extra wide profile which takes 100 percent of the guesswork out of determining the exact center. 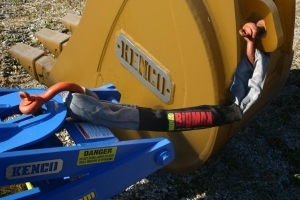 There are no hydraulics needed as the entire functioning of the pipe lifter is mechanically driven. 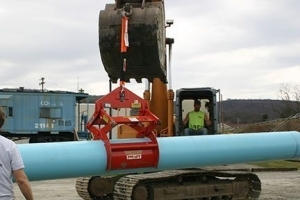 The pipe is lifted easily and safely, each and every time. The operator remains in full control of the movement of laying the pipe itself, saving both time and money on the jobsite. The Kenco Pipe Lift is also completely hands-free. Our internal actuator system allows for each pipe pick to occur one right after another. The initial cycle will grab a single pipe and a second cycle locks the tongs open for a second pick. No additional workers are needed which improves both safety and efficiency. Each Kenco Pipe Lift model has a range of pipe diameters it can lift. Whether it be removal or installation of ductile iron, steel, pvc or even concrete pipe, we have a lifter for it. We also offer an optional rubber lining (use to help protect the pipe. 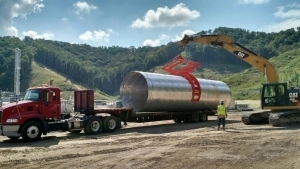 Our specially designed pipe handling devices have grip ranges from 4” to 48” so there is likely an off-the-shelf model that will work for the job. Kenco also certifies each and every pipe lift that leaves our facility. See more about that HERE. The safety and efficiency of a Kenco Pipe Lift is miles above any competitor on the market. What else would you expect from a company that has been in the below the hook lifting industry for over 30 years?! Shop now and get one for your jobsite today! DFW International Airport is undergoing a massive seven year – $900 million dollar terminal renovation project. One of the tasks is to connect the airport to downtown Dallas via the DART rail, which is a light rail system. The DART will run between Northbound Service Road and Northbound International Parkway, and under Taxiway Yankee and Taxiway Zulu at the North end of the airport. Due to the type of work that needs to be accomplished, multiple lane closures are needed in various phases throughout the project Phillips May Corporation of Dallas, Texas assisted with the project. In June and July 2013, development included lane closures of the 3 lane Northbound Service Road . 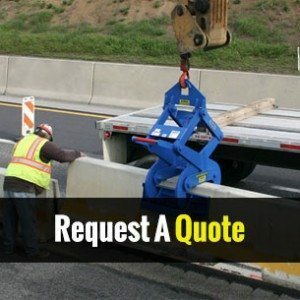 Thirty-foot concrete traffic barriers (CTB) were delivered to the site on flat bed semi trucks. Using two Gehl telescopic handlers that were each fitted with a Kenco KL 9000 Barrier Lift, the wall segments were removed in unison from the truck beds. The Kenco Barrier Lifts made a light task of what could have been heavy work. The CTB was picked up and placed in desired location, while flaggers were able to maintain one clear traffic lane during the operation. 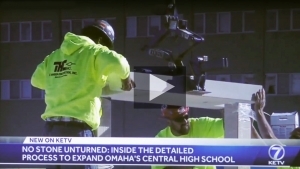 One concern that was encountered was how to place and align the CTB under the overpasses of the Taxiways. The low height considerations posed a possibility of the machine damaging the overhead structure. To add to the challenge, the roadway converges to only two lanes at these points, and the airport still required that one lane remain open for traffic. Once again, the Kenco Barrier Lift resolved the situation. A KL 30000 was chosen to handle the wall capacity and it was attached to a Volvo 320 excavator. Tyson Proovost operated the Volvo, maneuvering it along the future rail path and setting the CTB into position without disrupting the traffic flow.